This poem was originally published June 25, 2012. The Pre-Raphaelite movement was the first movement or genre in art history that I was drawn to back when I was about twelve. It lead to a lifelong passion for the arts. I immediately fell in love with the works of Rossetti, Hunt, Millais, Burne-Jones, and Waterhouse. Their works collectively cast a spell on me that has held me in its sway ever since. I’ve frequently turned to my favourite works of art, literature, and film for poetic inspiration. In this case, it’s most evident, as I sought to evoke, or at least allude to, the imagery of Dante Gabriel Rossetti. Particularly, I wanted to pay homage to Alexa Wilding, who was Rossetti’s muse, and whose face has become synonymous with Pre-Raphaelitism. Of all Rossetti’s major muses and models, Wilding is the least known about and this may be due to the fact tat she is the only one with whom there are no love letters to document a possible affair. 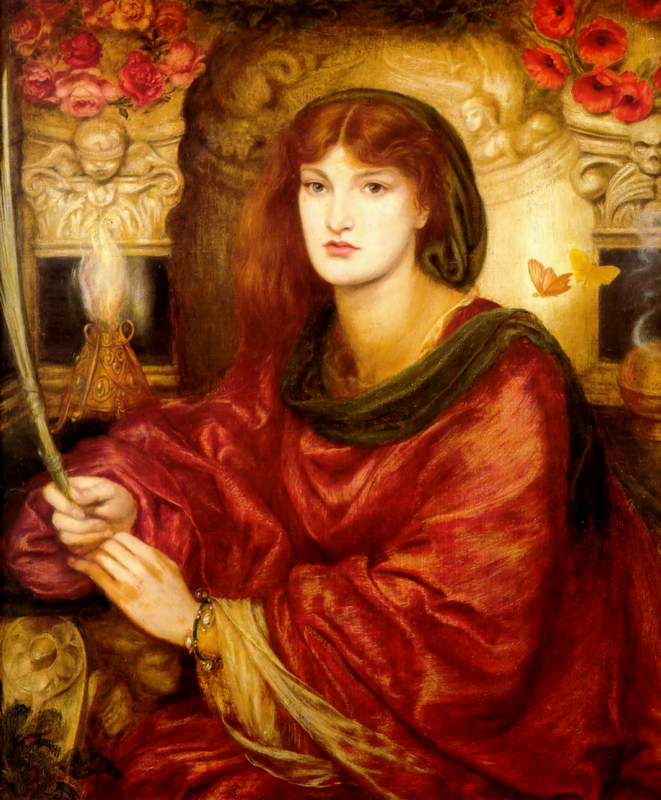 “Sibylla Palmifera” by Dante Gabriel Rossetti (1866-1870). “Lady Lilith” by Dante Gabriel Rossetti (1866-1868, altered 1872-1873). The lines of the poem reference two paintings: Sibylla Palmifera and Lady Lilith. These two paintings were intended as companion pieces to one another. Alexa Wilding appears in both, however, Lady Lilith was originally painted with Rossetti’s previous muse, Fanny Cornforth, as its model. Five to seven years later, Rossetti altered the painting, placing Wilding’s face over Cornforth’s. This is referenced in the first four lines of the poem. Lilith, in Hebrew mythology, is the first wife of Adam who is banished from Eden after crying out the secret sacred name of God. She dwells in the desert lands outside of Eden and preys upon men given to temptation and feasts on the blood of innocents. She is the Queen of the Night, the Mother of Demons, and the First Vampire. During the Medieval period, Lilith’s myth was expounded upon and expanded, and she was dubbed the Devil’s Concubine, a title that was also applied to the Fallen Angels that followed Satan. The phrase was also uttered by the character of Van Helsing in Bram Stoker’s Dracula, the Francis Ford Coppola-directed adaptation of the late Victorian era Gothic novel Dracula to describe the character Lucy after she became a vampire. In the film, Lucy is depicted with long, flowing red hair, and her sexualized nature, in stark contrast to the virginal Mina, foreshadows her becoming a predatory creature of the night. This ties into Victorian ideas about femininity, which I have elucidated on in a number of essays, in which women were either seen as saints or sinners, as domesticated matrons or lowly prostitutes, as the Virgin Mary or Jezebel. Cornforth seems to fall into the latter category while Wilding falls into the former, at least in how Rossetti depicted them, and this makes his alteration of Lady Lilith all the more interesting because it stands out from the conventions he created around Wilding. In the poem I also alluded to the sad reality that Cornforth went mad, was forced into a workhouse her sister-in-law, gradually losing her memory, becoming unable to carry on conversations, and finally living the last years of her life in an insane asylum. She died at age 74. 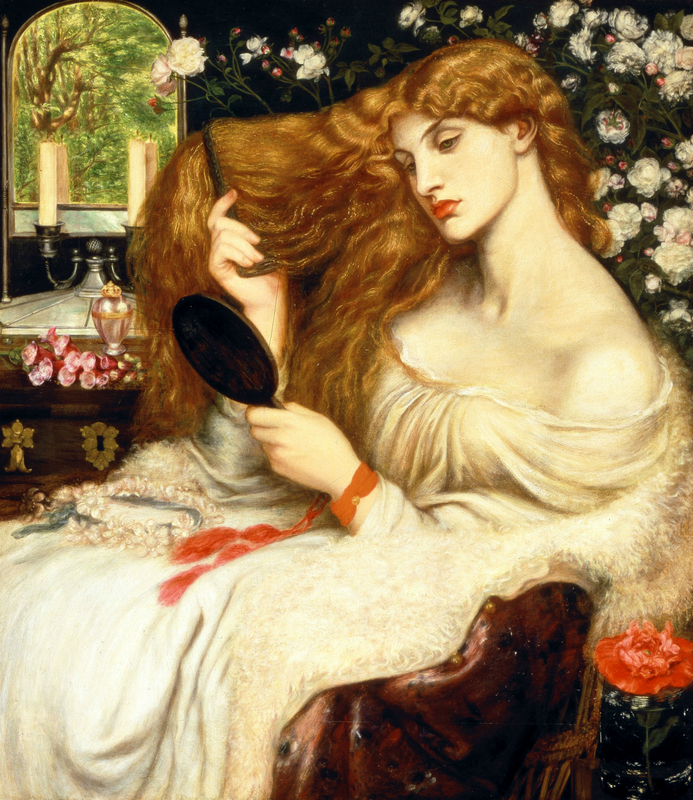 As Rossetti’s muse and mistress, Cornforth went from being a celebrated muse and model, living in lush life to basically being exploited and eventually abandoned to her own insanity. As the original model for Lady Lilith, this somewhat echoed the fate of the mythological Lilith’s exile from the garden of Eden. Alexa Wilding‘s own fate was just as tragic. She died around the age of 37, half the age of Cornforth, due to peritonitis and extreme exhaustion. While Cornforth had been voluptuous and represented the physical world and the body to Rossetti, Wilding’s depictions were more spiritual and ethereal, and she may have been seen as his ideal model, often embodying the soul itself. Rossetti’s last painting of Wilding was begun when she was only 27 and completed four years later. She would eventually be replaced as his muse by Jane Morris. He would die in 1882, just two years before Wilding in 1884, and she was said to place wreathes on the site of his grave.